HelioScope offers a variety of methods to set the spacing between rows of modules. 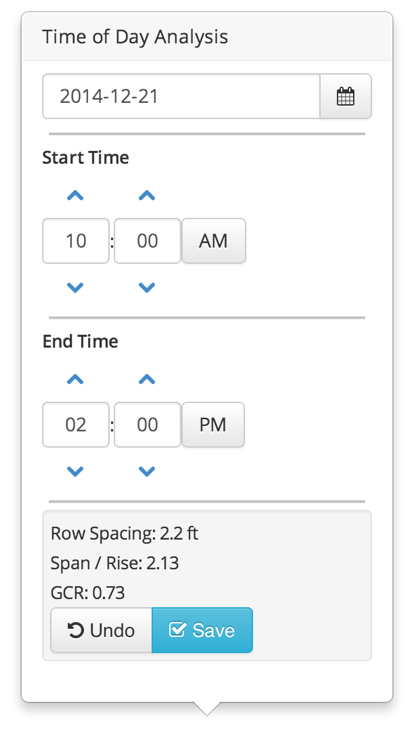 The three metrics (row spacing, span-to-rise, and ground coverage ratio) are all connected, so changes to one will automatically change the other two. Additionally, the user can set module spacing based on sun angles at a specific date and time (typically the winter solstice). The span-to-rise ratio is based on the front-to-back distance between modules, divided by the height at the back of the module bank. Note that this metric is sensitive to whether the bank has multiple modules, or the tilt of the module, since either of these will increase the rise distance. The ground coverage ratio (GCR) describes the ratio of the active module area to the overall area of the array. In other words, it described the proportion of the system area that is used to collect sunlight. 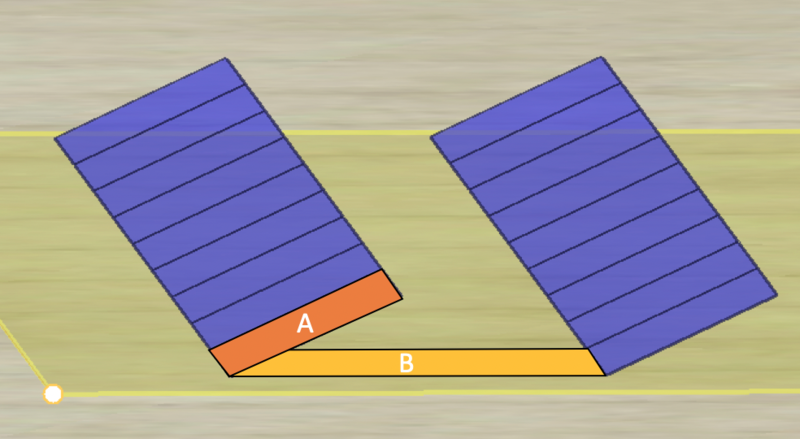 In the image above, the GCR is the module area (A) divided by the yellow area (B). Row spacing can also be defined based on the sun angles at a specific date and time range, typically the Winter Solstice from 10am to 2pm. This rule will space the modules as close as possible while maintaining no shade during the specified time window. One advantage of this approach is that it is based on the sun angles for the array’s specific location – therefore providing a rule that can be applied uniformly on Projects across a range of locations.